A round, tapered shape providing a 360° surface for your logo and advertising; to be seen from almost every direction.. Select from multiple sizes. Consider a fabric cover option for the bottom to create another surface for your graphics. Motored rotation is also available. For larger exhibits the Tapered Round can be combined with overhead 2D signs for a great multi-dimensional look. 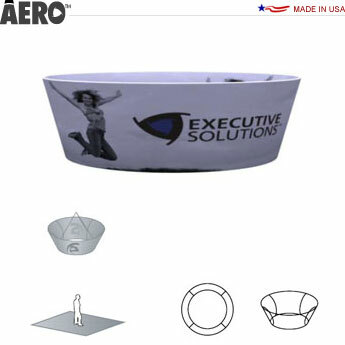 An Aero™ hanging banner requires no tools for assembly, utilizing simple push button connectors. Complete and detailed set up instructions will be included. Note that some tradeshows and other events may require that you employ rigging labor. Once your order is placed submit print-ready artwork according to the provided documents and artwork submission process. There are many options for customizing this banner display to your requirements, in ways not limited to the following lists. If you have ideas, questions, or would like a quote please contact us. Prepare print-ready artwork according to these documents. Allow 10–15 business days for production and graphics of standard shapes (rush orders available).